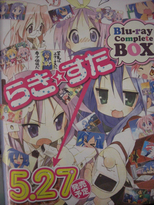 Lucky Star Blu-Ray Box Set Pre-Orders Now UP!!! Pre-orders are now up at AmiAmi for 10% off the MSRP at only 33,830 yen! …and where ever Japanese Blu-Rays and DVDs are sold. Honestly, I think that this is a amazing, amazing release. Finally, one of my all time favorite series is getting a Blu-Ray release. I am usually hesitant when it comes to purchasing Blu-Ray releases of entire series due to the price. I’ve held off on buying the Blu-Ray releases of the Haruhi Series, Ga-Rei Series and Cardcaptor Sakura Series. However, I just cannot say no to this. Besides holding great sentimental value for me, being one of the first series that actually made me ‘dedicate’ my life to Otaku Culture, the release itself looks really great. First off, it’s Lucky Star in HD!!! The release also has ENGLISH SUBTITLES, okay special features and it even includes the Lucky Star in Budokan footage. I would have liked it if they had added more behind the scenes stuff (interviews and the like), but that’s just me. I have seen many Ani-Song concerts including the Macross Frontier ones, Haruhi ones, K-On ones and of course the Lucky Star one. Out of all of them, I have to say that the Lucky Star concert was the best. It had the best staging, the best performances (yeah, the Haruhi one was really bad at times) and most importantly, the best feel. You could really tell that everyone was really into it, enjoying it and giving it their all. I was simply blown away by Shiraishi Minoru. Not only did he host the event and conduct the interview, he was still able to pull of an amazing performance. How that man was able to keep his voice going for so long I’ll never know. In short, I myself really enjoyed watching the concert and definitely recommend every Lucky Star fan to watch it. Next stop on my Lucky Star pilgrimage is Kasukabe where Kyoei/Kyouei High School, the real-life high school that Lucky Star’s Ryōō High School is based on, is located! In this installment of Actar’s Road Trips, follow me on my Lucky Star pilgrimage as I travel to Saitama, home of Lucky Star! To usher in the New Year, our first stop is none other than the shrine where Hiiragi sisters work at as Mikos, Washinomiya Shrine! Disclaimer: It is not my intention to offend any person or religion with this video. This video is meant to introduce the wonders of Japanese Culture and Tradition to others. Comparing the Anime scenes to the real-life counterparts shows how accurately Japanese Anime is able to portray and convey one’s culture to others. As with any religion, I understand and honor the traditions and rules and abide by them respectfully.